Note that the recommended approach is to reinitialize the slave – this requires downtime of the application in order to get a quiesced system. In our case, we knew our conflict was most likely due to bringing up the same data in both sites as part of our DR setup work. The application does an update of the data, which caused this conflict to occur. This requires knowledge of the data to determine if the conflicts can be accepted. 1 Notification received NOTE: If using Peer-to-peer replication, make sure that alerts have been enabled.See How to: Configure Predefined Replication Alerts (SQL Server Management Studio) for details. 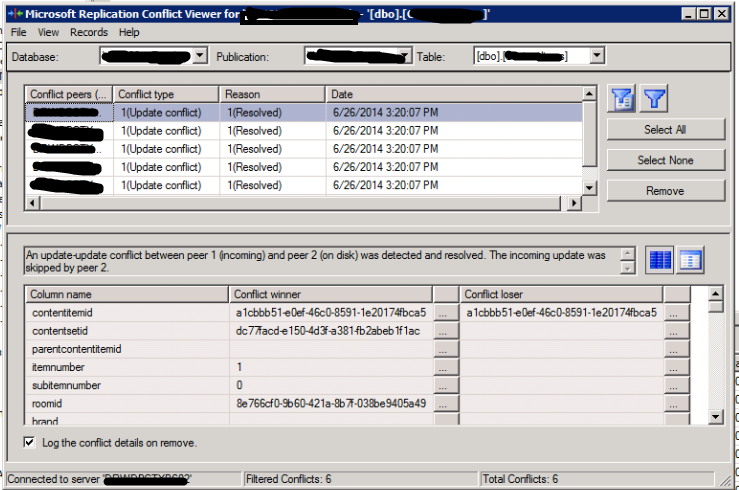 In the Select Conflict Table dialog box, select a database, publication, and table for which to view conflicts. When you click on each conflict, you will see the conflict winners & losers and need to determine what will need to be fixed. With Reason Unresolved – SQL Server was not able to address the conflict. Once reviewed, you can remove the conflicts from the table. 5 Disable continue on conflict detection check p2p_continue_onconflict needs to be set to FALSE, so we will be notified of future conflicts. Once finished (depends on the time of your system, this seems to run in background – this is about 10 minutes on my 90 GB system), you can select to look for differences. Note that if you have timestamp datatypes, you will not get a consistent checksum on your validation checks.